Planning your summer 2012 family trip to Ocean City Md is going to be an affordable vacation, especially when you arrive. Take a look at all the great, FREE activities that all ages can take advantage of! Movies on the Beach start at 8:30 p.m. every Monday and Friday, at 27th Street from June 25 - August 10, 2012. Movies start around 8:30 p.m. and run to around 10:30 p.m., weather permitting. 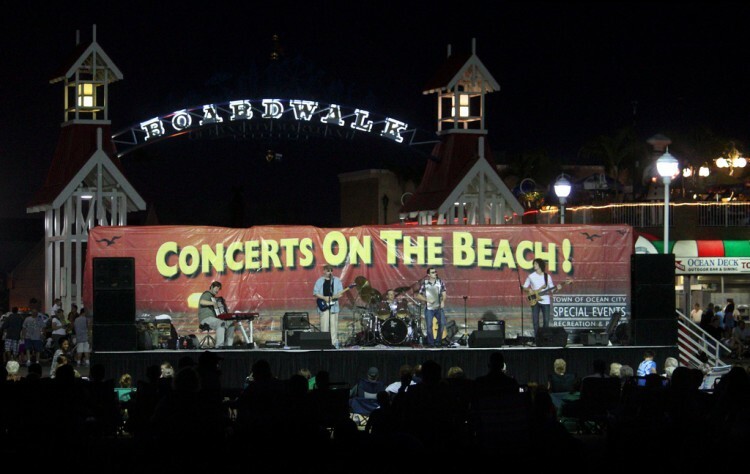 Free Concerts on the Beach feature music for the whole family, Wednesday evenings from 8 p.m. to 9:30 p.m. at the Division Street beach. Bring your beach chairs and/or blankets, and enjoy beautiful music in a beautiful setting! July & August 2012. The Family Beach Olympics are held Tuesday evenings from 6:30 p.m. to 8:30 p.m. on the 27th Street beach. Events include sand castle contests, tug of war, relay games and more. (Children must be accompanied by parents or guardians.) And after the activities, stick around for a Movie on the Beach! Find out more information, details and cool ideas on ococean.com including 100 Free OC Activites and Free Family Fun.